Imagina que un grupo de mujeres con barba interrumpa en una reunión de alcaldes o comisionariOOOOs o de lo que sea. Eso es lo que hace un grupo de acción creado por mujeres francesas desde 2008. "te anuncio lo que creo"
...en favor/por el campamento internacional de solidaridad de mujeres de Haiti ¿y tú que haces? He adoptado mi nueva firma. Quiero mostrar mi apoyo. ¿Y tú que haces? ¿Firmas conmigo este billete? puedes personalizar tu mensaje en la sección comentarios. Gracias a las compañeras de de la lista GéneroUrban por su ayuda en encontrar palabras para demostrar mi solidaridad con las mujeres de Haiti, de Chile y del mundo. http://elistas.egrupos.net/lista/generourban (mensajes 2527 a 2566) del 4 de marzo a 7 de marzo. Hare una última actualización mañana día 8 de marzo. ¡Comparto mis colores por el campamento internacional de solidaridad de las mujeres de Haiti! ¿Y tú que haces? J’affiche mes couleurs en faveur du camp de solidarité international des femmes d'Haïti! Et toi, qu'est-ce que tu fais? 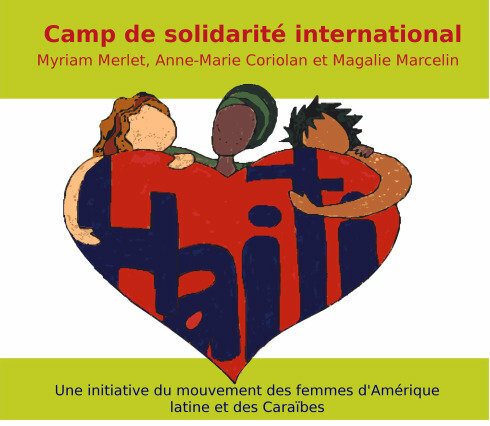 ES ¡Comparto mis colores por el campamento de solidaridad internacional Myriam Merlet Anne-Marie Coriolan y Magalie Marcelin. Más información en Radio internacional feminista y en el sitio Web de "Solidaridad feminista a Haiti"(lanzamiento el 8 de marzo 2010). FR J’affiche mes couleurs en faveur du "Camp de solidarité international Myriam Merlet, Anne-Marie Coriolan et Magalie Marcelin". Plus d'information en français et créole sur le site web de l'Orégand et sur le site Web du camp "Solidaridad feminista a Haiti" (lancement le 8 mars 2010). EN FR ES Facebook Solidarity Camp Myriam Merlet, Anne Marie Coriolan et Magalie MarcelinFeminist International Solidarity Camp to help mobilize and transfer resources, and to open channels of communications directly with Haitian women will open next week on the frontier Jemaní between the Dominican Republic & Haiti. As a project organized by women’s groups in Haiti, the Dominican Republic, and elsewhere in Latin America & the Caribbean and beyond, the Camp will be eventually handed over to Haitian women. Photo: subliminal image about gender equality with Berlaymont and justus Lipsius buildings in Brussels. Ahead of International Women's Day, Vice-President Viviane Reding, Commissioner for Justice, Fundamental Rights and Citizenship, will present the new findings of a Eurobarometer survey on attitudes to gender equality. How is gender equality perceived in the EU? Is the EU doing enough? What are priority areas for action? The European Commission will address all these questions with the launch the Gender Pay Gap Campaign 2010. In this fourth issue of the European Gender Equality Law Review several experts via their individual contributions, the independent experts of the European Network of Legal Experts in the field of Gender Equality highlight interesting developments at national level. Daniela Bankier, Head of the European Commission’s unit for Equality between Men and Women, called for the gender pay gap to be urgently addressed as it leads to a waste of resources for society and businesses. The 4th Action Programme for equal opportunities [2 MB] for the period 2004-2008 is currently (still) being implemented. Which are the results? Why at least two years of delay to present the following plan?